"[Editor's Note: The following is a combined review with LILLY'S PURPLE PLASTIC PURSE, PICKLES FROM PITTSBURGH, CHATO'S KITCHEN, and PETE'S A PIZZA.] --Special relationships between characters are the stuff of engaging stories. Each character becomes a vivid part of the listener's imagination. 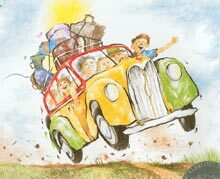 In THE RELATIVES CAME, the annual summer trip is fondly remembered. Similar car trips, greetings, spreads of food and conversation, and bulging houses will spring to mind. The relaxed pace of this recording provides the time to savor these memories. In PICKLES TO PITTSBURGH, Judi Barrett revisits the wonderful world of Chewandswallow, featuring immense foodstuffs, and from this world distinct characters emerge. Listeners will appreciate the interplay of Grandpa's adventure with Kate's dream and the relationships of the fantastic foods. In PETE'S A PIZZA, Pete is in a terrible state, and it is his father who has the wisdom to humor him back to his usual self by making Pete into a pizza pie. The giggles of Pete and the listeners increase as Pete is kneaded, stretched, spread, baked, and (almost) sliced. Food is also center stage in CHATO'S KITCHEN. In hospitable fashion, Chato invites his new neighbors to dinner. Dreaming of a mouse feast, Chato and his cat buddy think up and stir up a delicious meal with Spanish flavor, only to be greeted at the door by the mice and their special guest. The twist in the anticipated outcome and the deep richness of Chato's voice are memorable. While special treats baked for school are a part of the story, it is the interaction of Lilly with her teacher that is central and poignant in LILLY'S PURPLE PLASTIC PURSE. Their days have ups and downs in typical childlike mode as only Kevin Henkes can portray. Will Lilly weather the humiliation when Mr. Slinger takes (just for the day) her prized new possession? In this recording Lilly is enjoyably squeaky, and Mr. Slinger is kindly authoritative and wise. Background voices are used effectively to interject the "bubble stories" from the text. While listening to this collection of stories is a distinct pleasure, the illustrations help to make the experience memorable. Listen, look, and enjoy!"